The following is a report from Peter Gurry who attended the Research Summit on Collation of Ancient and Medieval Texts in Münster on 3-4 October. A few weeks ago I attended the Research Summit on Collation of Ancient and Medieval Texts in Münster, Germany and I thought I would offer a brief summary of some of the papers. The conference was designed to introduce textual scholars to the ins and outs of electronic collation in general and CollateX in particular. The first day was primarily focused on papers from invited speakers and the second day was set up to be more hands-on with CollateX. Readers of this blog will be interested to know that versions of Collate have been used for the Editio Critica Maior (ECM) since 1 John (published in 2003). The first presentation was from Caroline Macé of the Universität Frankfurt who spoke about her experience editing Gregory of Nazianzus. She spoke about the choice between collating and transcribing and suggested that the right choice depends on the purpose of the edition being made. For Gregory, she had around 140 manuscripts and decided that transcribing these would have been too much work with too little benefit. Her own preference, in fact, would be to have automated transcriptions from digital collations rather than automated collations from digital transcriptions. Next up was Peter Robinson whose pioneering work as a student at Oxford in the 1980s led to the first version of Collate (history here). Robinson spoke about misconceptions of digital collation, the main one being the belief that the computer does all the work. In actual fact, Robinson wrote Collate only after becoming dissatisfied with other collation software because he felt it was too mechanical; he wanted something that required editorial input during the collation process itself. He went on to argue that the purpose of a digital collation should not simply be to record differences but to use those differences to understand the relationships of witnesses. Like the CBGM, Robinson wants to use all textual variants for genealogy rather than just a selection. The use of complete collations is what led to a revision in previous genealogies in the recent electronic edition of Dante’s Commedia. The third presentation was offered by Klaus Wachtel and David Parker about their use of Collate for the ECM. For John’s Gospel, the team in Birmingham has incorporated Collate into their own editing software (mentioned here) which allows them to move from transcriptions, to regularization of spelling, to construction of the apparatus, all in one place. It was impressive. In all, Parker said that the new software has made constructing the apparatus faster and more accurate. If my notes are right, he said it took them about 6 months to construct a full apparatus for the Greek witnesses of John. Barbara Bordalejo presented next on the praxis of collation and gave some fun examples of how hard but also important it can be to electronically encode the complexities encountered in a manuscript. 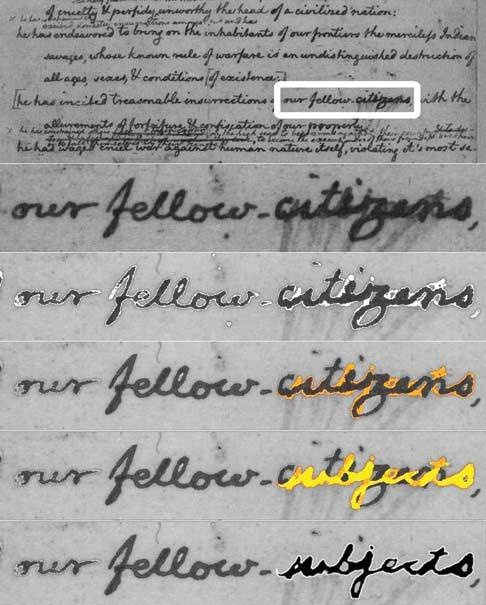 She showed examples of the change in the first draft of the Declaration of Independence including the change discovered in 2010 from “our fellow subjects” to “our fellow citizens”—a small change that makes a big difference! (But given my current home I shall say no more about that.) At the end of her talk there was a brief but lively back-and-forth over whether an expunction dot should be marked in a transcription as a “deletion” or as “marked for deletion” in order to distinguish it from the ways other scribes in the same manuscript deleted text. The final talk was offered by Ronald Dekker, one of the programmers behind CollateX, who talked about some of the principles behind the software’s collation algorithms. The hardest part, as any human collator knows, is deciding how to segment the texts for comparison; the actual comparison is the easy part. Peter Robinson told us at one point that only about 1–2 percent of his original code was actually for comparing the texts; most of the rest was used to identify which parts of each text to compare with each other (a process known as “alignment”). Dekker illustrated the complexity of programming these decisions by showing that two witnesses with 100 segments (or “tokens”) could potentially produce as many as 10,201 possible points of disagreement (or “nodes”). Unfortunately I had to catch a train the next morning so I wasn’t able to attend the second day of the conference. But the first day provided a good sense of where digital collation is and how it is being used. And as always, it was good to meet and talk with scholars editing a variety of other texts. The only real disappointment for me was learning that the location had originally been set for Iceland. I guess there’s always next time. Finally, my thanks to Joris van Zundert and Klaus Wachtel for all their behind the scenes work in organizing the conference for us. 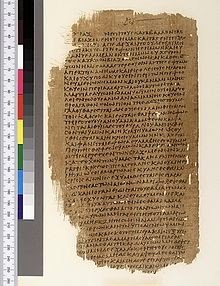 Any information on claim about 1st century Latin text? 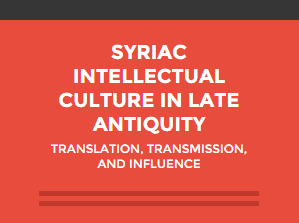 This conference explores the intellectual cultures of Syriac-language literary and scholarly communities of the late antique (c. 3rd–9th century) Near and Middle East. It will also provide an opportunity for postgraduate and emerging scholars in the fields of biblical studies, theology and religion, late antique and Byzantine studies, near eastern studies, and rabbinics to present their work on Syriac literature within the University of Oxford’s vibrant late antique studies community. 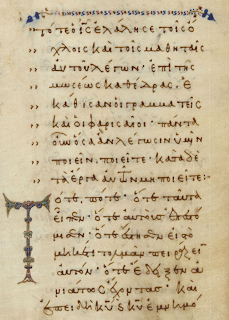 The reception and revision of Syriac biblical translations, especially works such as the Harklean and Syrohexaplaric versions and Jacob of Edessa’s Old Testament revision. How did Syriac authors navigate the diversity of translation options available to them? How were later translations and revisions received in both exegetical and liturgical contexts? Which textual variants were employed by exegetes, and in what contexts? 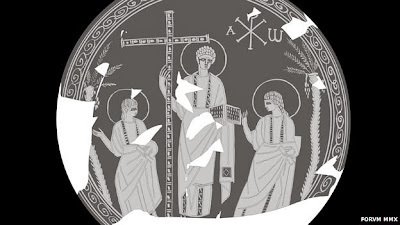 What role do translations of Greek patristic literature, such as the works of Gregory Nazianzen and Theodore of Mopsuestia, play in the context of Syriac literature? How is material from Greek historiography, such as the ecclesiastical histories of Eusebius, Socrates, and Theodoret, translated and transmitted by Syriac chroniclers? What factors played a part in the development of literary canons and exegetical traditions in Syriac? How did different communities determine which texts to elevate to canonical status? When and why were authors from rival communities read and utilized? How did Greek-language authors, such as Severus of Antioch, undergo a process of ‘Syriacization’? Which authors survived the decline of spoken Syriac and were translated into Christian Arabic, and how? What forms did Syriac intellectual life take over the course of the period, in monastic, scholarly, and church communities? How did Syriac culture react to and interact with influences such as Aristotelian and neo-Platonist thought, rabbinic scholarship, and other vernacular literatures? What role did Syriac scholars play in the early development of Arabic-language intellectual culture, and how did this role affect or change their own traditions? Those wishing to present a twenty-minute paper may submit a brief abstract (250 words or less) and academic biography to oxfordsyriac2015@gmail.com. The deadline for submissions is Monday, 17 November 2014. For those of you attending SBL and interested in textual criticism, the annual blog dinner will take place after the NTTC session on Sunday night "Nestle-Aland 28th Revised Edition" (4:00-6:30pm, Hilton Bayfront, Sapphire Ballroom L). After the session finishes, we will walk together to the Hard Rock, where we have reserved the "Surf Shack" room. The $22 group menu choice is required for the room reservation, and includes a beverage, entrée, dessert, tax and gratuity. If you wish to join us, please RSVP in the comments below or send me an email. The invitation is open to all who are interested in textual criticism, and who are desirous to hear Peter Head's customary year-in-review speech. In July 2015, biblical scholars and theologians from around the world will gather to consider the Book of Jeremiah, using this ancient text to bring exegesis and theology into conversation. The conference organisers and the School of Divinity at the University of St Andrews are delighted to invite you to join the conversation. You can also find us on Facebook at https://www.facebook.com/2015Jeremiah and follow us on Twitter at https://twitter.com/2015Jeremiah (@2015Jeremiah). Further details of registration will appear here in early Autumn; in the meantime, please submit paper proposals of no more than 500 words (not including paper titles) to Penelope Barter pb242@st-andrews.ac.uk. Proposals are due by midnight GMT on Friday 27th February 2015 for consideration in early March. 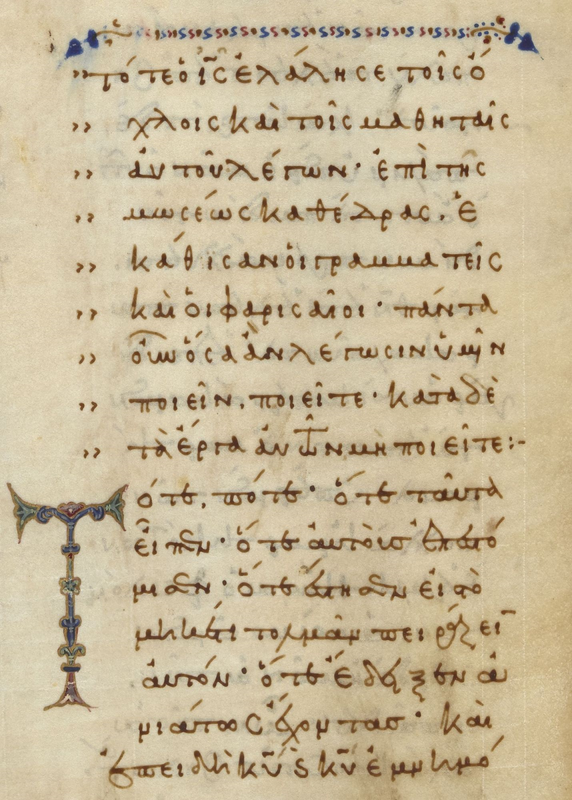 Though I don't think that there is much biblical stuff in the latest batch of Greek mss put online by the British Library, there is always something interesting, and this time it is a citation from the Gospel of Matthew. You can find the BL blog post here from which I copied below the image of Add MS 24371, sermons by Chrysostom. At the top of the page Mat 23:1-3 is cited and these words are marked, as usual, with diples '>>' in the left margin. There is a nice textual variant here from line 6 on: πάντα οὖν ὅσα ἄν λέγωσιν ὑμῶν ποιεῖν, ποιεῖτε. (All that they tell you to do, do). Here is a collection of surveys of scholarship on Mark. I couldn't find one which summarised text-critical work on Mark's Gospel. R.S. Barbour, ‘Recent Study of the Gospel according to St. Mark’ Exp T 79 (1967-68), 324-329. H.C. Kee, ‘Mark as Redactor and Theologian: A Survey of some recent Markan Studies’ JBL 90 (1971), 333-336. H.C. Kee, ‘Mark’s Gospel in Recent Resarch’ Interpretation 32 (1978), 353-368. S.P. Kealy, Mark’s Gospel: A History of its Interpretation, From the Beginning Until 1979 (New York: Paulist, 1982). W. Telford, ‘Introduction: The Gospel of Mark’ The Interpretation of Mark (ed. W. Telford; Edinburgh: T&T Clark, 1985), 1-41. L.W. Hurtado, ‘The Gospel of Mark in recent study’ Themelios 14 (1989), 47-52. W.L. Lane, ‘The Present State of Markan Studies’ The Gospels Today: A Guide to Some Recent Developments (The New Testament Student VI; ed. J.H. Skilton, M.J. Robertson III & W.L. Lane; Philadelphia: Skilton House, 1990), 51-81. F.J. Matera, What are they Saying about Mark? (New York: Paulist, 1987). M.M. Jacobs, ‘Mark’s Jesus through the Eyes of Twentieth Century New Testament Scholars’ Neotestamentica 28 (1994), 53-85. W. Telford, ‘The Interpretation of Mark: A History of Developments and Issues’ The Interpretation of Mark (ed. W. Telford; Edinburgh: T&T Clark, 1995, 2nd ed. ), 1-61. P.G. Bolt, ‘Mark’s Gospel’ in The Face of New Testament Studies: A Survey of Recent Research (ed. S. McKnight & G.R. Osborne; Grand Rapids: Baker Academic, 2004), 391-413. K.W. Larsen, ‘The Structure of Mark’s Gospel: Current Proposals’ CBR 3 (2004), 140-160. D.J. Harrington, What are they Saying about Mark? (New York: Paulist, 2004). C. Breytenbach, ‘Current Research on the Gospel according to Mark: A Report on Monographs Published from 2000-2009’ in Mark and Matthew I: Comparative Readings: Understanding the Earliest Gospels in their First-Century Settings (ed. E-M. Becker & A. Runesson; WUNT I.271; Tübingen: Mohr Siebeck, 2011), 13-32. H. M. Humphrey, A Bibliography for the Gospel of Mark, 1954-1980 (Studies in the Bible and Early Christianity, 1; New York: Edwin Mellen, 1981). H.M. Humphrey, The Gospel of Mark: An Indexed Bibliography 1980-2005 (New York: Edwin Mellen, 2006). F. Neirynck (et al. ), The Gospel of Mark: A Cumulative Bibliography, 1950-1990 (BETL 102; Leuven: Leuven UP & Peeters, 1992). Early Readers, Scholars and Editors of the New Testament on Sale! Contributions by Thomas O'Loughlin, Hans Förster, Ulrike Swoboda, Satoshi Toda, Rebekka Schirner, Oliver Norris, Rosalind MacLachlan, Matthew Steinfeld, Amy Anderson and Simon Crisp. The New Testament text has a long and varied history, in which readers, scholars and editors all play a part. Understanding the ways in which these users engage with the text, including the physical form in which they encounter the Bible, its role in liturgy, the creation of scholarly apparatus and commentary, types of quotation and allusion, and creative rewriting in different languages or genres, offers insight into its tradition and dissemination. The ten papers in this volume present original research focusing on primary material in a variety of fields and languages. Their scope stretches from the evidence in the gospels for ‘ministers of the word’, and the sources used by the evangelists, to the complex history and politics of a twentieth-century critical edition. Key third- and fourth-century figures are assessed, including Origen, Eusebius of Caesarea and Augustine, as well as an anonymous commentary on Paul used by Pelagius and only preserved in a single ninth-century manuscript. Traces of a pre-Vulgate Latin version are detected in the poetry of Sedulius, while early translations in general are explored as a way of shedding light on the initial reception of the gospels. One of the earliest scholarly ‘editions’ of the gospels, underlying the manuscripts known as Family 1, is examined in Mark. The contributors were all participants in the eighth Birmingham Colloquium on the Textual Criticism of the New Testament, an international gathering of established and emerging scholars whose work reflects the excitement and diversity of New Testament textual scholarship today. A young researcher, named Balazs Mikusi, found Mozart's own score of the Piano Sonata in A. He was a clever researcher because he was in a library 'leafing through folders of unidentified manuscripts'. That is the best place to discover manuscripts. In the recent issue of Archiv für Papyrusforschung 60/1 (2014), Brent Nongbri has published an article on "The Acquisition of the University of Michigan's Portion of the Chester Beatty Biblical Papyri and a New Suggested Provenance." The goal of this paper was two-fold – to clarify the history of acquisitions of Beatty biblical papyri and to reassess what we know of the provenance of the find. I am reasonably satisfied with the results of the first task. As to the reassessment of provenance, I think dissatisfaction is the order of the day. Brent has kindly made his article available here. The great Latin Bibles, in huge multiple volumes, are by far the largest and most spectacular manuscripts commissioned in England in the 12th century, decorated with magnificent illuminated pictures. The lectures will consider the purpose of such books and why they were suddenly so fashionable and also why they passed out of fashion in England during the second half of the 12th century. The first lecture will consider the purpose of such books and why they were suddenly so fashionable. It will look principally at the Bible of Bury St Edmunds Abbey, now in the Parker Library at Corpus Christi College, Cambridge. The manuscript was commissioned in the time of Anselm, abbot of Bury 1121-48. A chronicle of the abbey records that the cost for it was found by Hervey, brother of Talbot the prior, and that the manuscript was incomparably decorated by the hand of Master Hugo. The work is usually dated to around 1130. Hugo is the earliest professional artist in England whose name is known. This lecture will discuss what we can tell about Hugo and his work, from close examination of the manuscript itself. It will look at the larger questions of where exemplars and materials were found for the Bible, and at the phenomenal expense of such undertakings. The Winchester Bible is still in the cathedral where it was commissioned, doubtless by Henry of Blois, bishop of Winchester 1129-71. It too was illuminated by professional painters, who apparently also worked on frescoes in Spain. This year the manuscript is being rebound in preparation for exhibition in New York and eventual installation in a new display gallery in Winchester Cathedral. 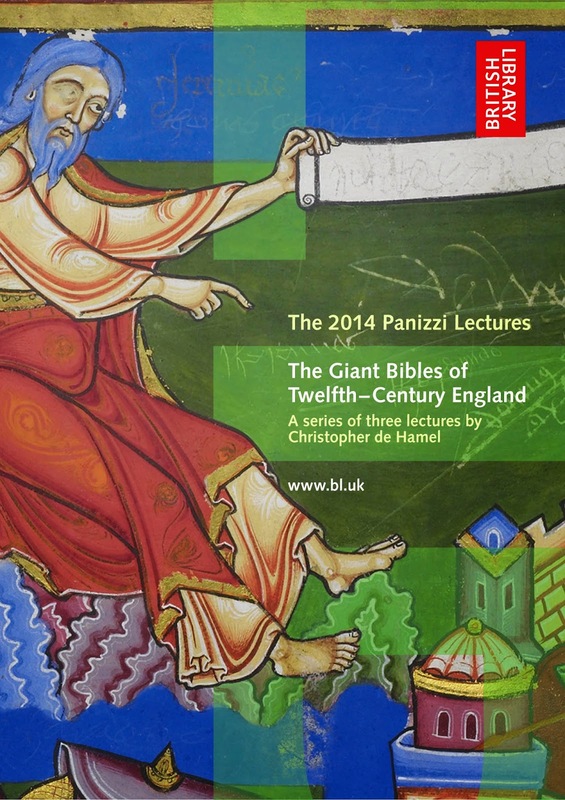 The lecture will take advantage of its disbinding to make new observations about its production, and to suggest new dates for the different phases of the work, undertaken in parallel with a second (but lesser) giant Bible from Winchester, now in the Bodleian Library, MS Auct. E. Infra 1 and 2. These two Bibles were constantly changed and upgraded during production, which came to an abrupt end on the death of Henry of Blois on 8 August 1171. They were then taken up again a decade later, the Bodleian Bible was finally completed, and the two sets were corrected against each other. The Winchester volumes, however, were eventually abandoned a second time and were wrapped up still unfinished. One volume of the vast Lambeth Bible has been in the library of Lambeth Palace since its foundation in 1610. The long-lost second volume is owned by All Saints’ Church in Maidstone and is on permanent deposit at the Maidstone Museum. Despite its fame and quality of illumination, nothing has been hitherto known about the Bible’s original owner or patron. This lecture will propose that it was commissioned around 1148 for Faversham Abbey by King Stephen, king of England 1135-54, elder brother of Henry of Blois and protagonist with the Empress Matilda in the civil war of the 12th century. This involves analysis of the unusual iconography of the miniatures, rich in dynastic imagery, and an investigation of the earlier career of the principal artist in the production of manuscripts in a professional scriptorium at Avesnes Abbey in Flanders. The eleventh international conference of the European Society for Textual Scholarship, TEXTUAL TRAILS. Transmissions of Oral and Written Texts (Helsinki, 30 October – 1 November 2014), will explore all kinds of textual trails from various angles of scholarly editing and textual scholarship. We are looking forward to an exciting three-day programme with almost 70 papers by textual scholars from four continents and over twenty countries. 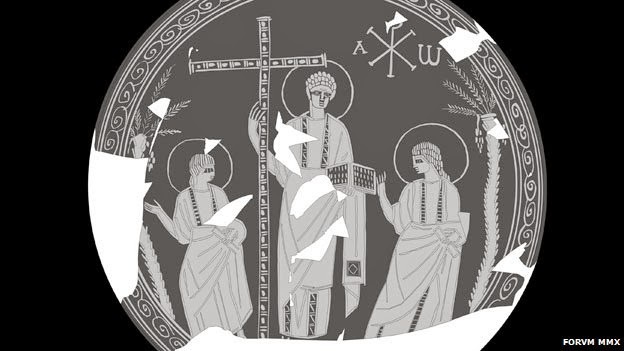 The central figure holding the cross is in all likelihood a depiction of Christ, while the two others I would take as the angels present at the resurrection, not unlike the Gospel of Peter. What is interesting though, is that Christ holds a small codex in his hand, while both companions each seem to hold a scroll. 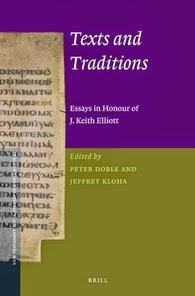 The methodology of New Testament textual criticism, the critical evaluation of readings, and the history and texts of early Christianity is the focus of the influential work of J. K. Elliott. Readings in Early Christianity: Texts and Traditions offers eighteen essays in his honour. The essays, by colleagues and students from his long career, reflect Elliott's wide interest and impact. 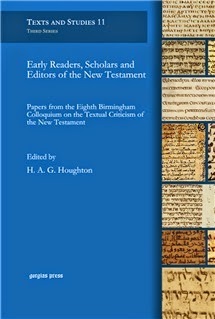 From questions of the purpose and practice of textual criticism, to detailed assessment of New Testament literature and the readings of its manuscripts, to provocative studies of the reception of Jesus and the New Testament in the second century, this volume will be of value to those studying the New Testament and Early Christianity. Eva Villani, Il lessico Ambrosiano inedito ΑΝΤΙΧΕΙΡ (C 222 inf., ff. 207r-208v). Milano: EDUCatt, 2014. Pp. 248. ISBN 9788867800865. €15.00 (pb). NB Dickey's closing comment: "In short, this work is good and useful and provides scholars with the rare opportunity to explore a previously unknown text containing a significant amount of ancient material; it would be lovely if there were more dissertations of this type." Bible Odyssey Featuring "Alexandrian Text" and "Early Versions"
A year ago or so I was invited to contribute to SBL's project Bible Odyssey which was launched about two months ago. I was told that this week my article on the "Alexandrian Text" is highlighted on the Bible Oddysey home page, together with an article on "The Earliest Versions and Translations of the Bible" by Brennan Breed and a timeline of "The History of the English Bible" and a newly added videoclip on Early Christian Martyrdom featuring Candida Moss. Just a week ago, John Kutsko of the SBL sent out a report about the two first months of the website, and it turns out that "People are very interested in ... 'life in first century Galilee' and 'how the Hebrew Bible relates to the ancient Near East,' as well as 'the binding of Isaac' and 'the woman caught in adultery. '” The last entry is written by my friend Jennifer Knust and we have worked a lot together on this topic for some years now. There is a related video clip in which Amy Jill Levine discusses the pericope adulterae, and another entry on the manuscript history of the passage (John 8:1-11) by another friend of mine, Chris Keith. Earlier this year, Chris, Jennifer and I contributed to a conference at SEBTS, the Pericope Adulterae symposium. Why does God speak in the plural in Genesis? Has the biblical figure of Satan evolved? Why is ‘almah in Proverbs 30:19 translated differently? How does domestic architecture vary in the Second Temple period?